The 1515L touchmonitors are designeddeveloped and built to provide the most cost-effective touch solutions for system integrators and VARs. 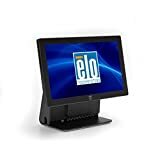 Aimed at the fast-changing retail POS and hospitality marketsthey provide reliabledurable operation and come from the worldwide leader in touchmonitorsElo TouchSystems. The optional 3-track magnetic stripe reader (MSR)programmable to either HID or Keyboard Emulation (USB only)is easily installed by the userproviding an elegantintegrated solution and eliminating the need for external brackets or attachments. The 1515L features a choice of touchscreen technologies: AccuTouch five-wire resistive technologythe most widely used for retail applications and proven to survive splashing liquidsfood and grease; IntelliTouch pure glass surface wave technologyfor the ultimate in optical quality for dry retail and hospitality applications; Acoustic Pulse Recognition for a pure-glass surface that recognizes sound from both hard and soft stylus touches; projected capacitive for a durablezero-bezelglass-to-edge surfacewith multi-touch.